Orientals are extremely fond of their people and will tell you exactly what they think, in a loud, raspy voice. The Oriental is best described as a color remake of the original “black and white” Siamese. The breed was developed using Siamese as the foundation breed and then crossing them with other breeds. The original intent was to broaden the Siamese gene pool in Britain because so many breeding programs had been devastated during World War II. Crosses with Russian Blues, British Shorthairs, Abyssinians and domestic shorthairs produced kittens without the pointed Siamese pattern, which were then bred back to Siamese. In just a few generations, breeders produced cats that looked exactly like Siamese, except for the variety of colors and patterns they displayed, as well as cats with the traditional pointed pattern. Cats with Siamese points were used in Siamese breeding programs, but the non-pointed cats became the basis for a new breed: the Oriental. When the cats began to be imported into the United States in the 1970s, crosses with American Shorthairs produced yet more colors and patterns. A longhaired variety was also developed. Today Orientals come in more than 300 colors and patterns, including pointed varieties. Pointed Orientals are not accepted by all cat associations, and some require them to be shown as Siamese. Orientals are medium-size cats that typically weigh 5 to 10 pounds. The Siamese and the Oriental might differ in color, but beneath the skin they are identical. The Oriental is talkative and opinionated. He will tell you exactly what he thinks, in a loud, raspy voice, and he expects you to pay attention and act on his advice. Orientals are extremely fond of their people. They like to be “helpful” and will follow you around and supervise your every move. When you are sitting down, an Oriental will be in your lap, and at night he will be in bed with you, probably under the covers with his head on the pillow. Do not get an Oriental if living with a chatty busybody would drive you insane. On the other hand, if you enjoy having someone to talk to throughout the day, an Oriental can be your best friend. Just be sure you have time to spend with this demanding and social cat. Orientals do not like being left alone for long periods, and if you work during the day it can be smart to get two of them so they can keep each other company. The Oriental is highly intelligent, agile and athletic, and loves to play. Keep his busy brain active with puzzle toys and his body exercised with teaser toys that he can chase and a big cat tree he can climb. He is fully capable of opening doors and drawers or rifling through your purse in search of something interesting or shiny to play with. Never leave him without any form of entertainment, or you will likely come home to find that he has reprogrammed your DVR to record only nature shows or at the very least decided that your toilet paper rolls and tissue boxes look better empty. Choose an Oriental if you look forward to spending time with and interacting with your cat. This is a loyal and loving feline who will pout and pine if given little or no attention. In the right home, however, he thrives for years. 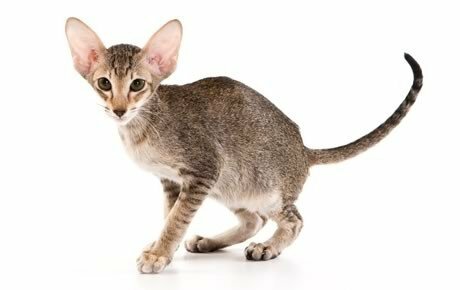 The short, fine coat of the Oriental Shorthair is easily cared for. Comb it every couple of weeks with a stainless steel comb or soft bristle brush to remove dead hair, then polish it with a soft cloth to make it shine. Brush the teeth to prevent periodontal disease. Daily dental hygiene is best, but weekly brushing is better than nothing. Wipe the corners of the eyes with a soft, damp cloth to remove any discharge. Use a separate area of the cloth for each eye so you don’t run the risk of spreading any infection. Check the ears weekly. If they look dirty, wipe them out with a cotton ball or soft damp cloth moistened with a 50-50 mixture of cider vinegar and warm water. Avoid using cotton swabs, which can damage the interior of the ear. Keep the Oriental’s litter box spotlessly clean. Cats are very particular about bathroom hygiene. It’s a good idea to keep an Oriental as an indoor-only cat to protect him from diseases spread by other cats, attacks by dogs or coyotes, and the other dangers that face cats who go outdoors, such as being hit by a car. Orientals who go outdoors also run the risk of being stolen by someone who would like to have such a beautiful cat without paying for it. Except for color, the Siamese and the Oriental are indistinguishable, having a svelte but muscular body with long lines and a wedge-shaped head that is long and tapering from the narrow point of the nose outward to the tips of the ears, forming a triangle. The unusually large ears are wide at the base and pointed at the tip, giving them the same triangular shape as the head. Medium-size eyes are almond-shaped. The body is often described as tubular and is supported by long, slim legs, with the hind legs higher than the front legs. The Oriental walks on small, dainty, oval paws and swishes a long, thin tail that tapers to a fine point. Oriental Longhairs have a medium-length coat that is fine and silky. It is longest on the plumed tail. Often nicknamed “Ornamentals” because of their extensive color palette, Orientals come in more colors and patterns than any other breed, including solid, shaded, smoke, parti-color, bi-color and tabby. Depending on the coat color, the eyes may be blue, green, or odd (one blue and one green). The active and social Oriental is a perfect choice for families with children and cat-friendly dogs. He will play fetch as well as any retriever, learns tricks easily and loves the attention he receives from children who treat him politely and with respect. He gets along with cats and dogs who respect his authority. Always introduce pets slowly and in controlled circumstances to ensure that they learn to get along together.